For other uses of "contemplation", see Contemplation (disambiguation). "Theoria" redirects here. For other uses, see Theoria (disambiguation). Christianity took up the use of both the Greek (theoria) and Latin (contemplatio, contemplation) terminology to describe various forms of prayer and the process of coming to know God. Eastern and Western traditions of Christianity grew apart as they incorporated the general notion of theoria into their respective teachings. The Catechism of the Catholic Church states that, "the Christian tradition comprises three major expressions of the life of prayer: vocal prayer, meditation, and contemplative prayer. They have in common the recollection of the heart." Three stages are discerned in contemplative practice, namely purgative contemplation, contemplation proper, and the vision of God. The Greek theoria (θεωρία), from which the English word "theory" (and "theatre") is derived, meant "contemplation, speculation, a looking at, things looked at", from theorein (θεωρεῖν) "to consider, speculate, look at", from theoros (θεωρός) "spectator", from thea (θέα) "a view" + horan (ὁρᾶν) "to see". It expressed the state of being a spectator. Both Greek θεωρία and Latin contemplatio primarily meant looking at things, whether with the eyes or with the mind. The word theoria is derived from a verb meaning to look, or to see: for the Greeks, knowing was a kind of seeing, a sort of intellectual seeing. Contemplation is, then, knowledge, knowledge of reality itself, as opposed to knowing how: the kind of know-how involved in getting things done. To this contrast between the active life and contemplation there corresponds a distinction in our understanding of what it is to be human between reason conceived as puzzling things out, solving problems, calculating and making decisions - referred to by the Greek words phronesis and dianoia, or in Latin by ratio - and reason conceived as receptive of truth, beholding, looking - referred to by the Greek words theoria or sophia (wisdom) or nous (intellect), or in Latin intellectus. Augustine expressed this distinction by using scientia for the kind of knowledge attained by ratio, and sapientia, wisdom, for the kind of knowledge received by intellectus. Human intelligence operates at two levels: a basic level concerned with doing things, and another level concerned with simply beholding, contemplating, knowing reality. According to William Johnston, until the sixth century the practice of what is now called mysticism was referred to by the term contemplatio, c.q. theoria. According to Johnston, "[b]oth contemplation and mysticism speak of the eye of love which is looking at, gazing at, aware of divine realities." Several scholars have demonstrated similarities between the Greek idea of theoria and the Indian idea of darśana (darshan), including Ian Rutherford and Gregory Grieve. The term theoria was used by the ancient Greeks to refer to the act of experiencing or observing, and then comprehending through nous. For Plato, what the contemplative (theoros) contemplates (theorei) are the Forms, the realities underlying the individual appearances, and one who contemplates these atemporal and aspatial realities is enriched with a perspective on ordinary things superior to that of ordinary people. Philip of Opus viewed theoria as contemplation of the stars, with practical effects in everyday life similar to those that Plato saw as following from contemplation of the Forms. As we go to the Olympian festival for the sake of the spectacle (θεᾶς), even if nothing more should come of it – for the theoria (θεωρία) itself is more precious than money; and just as we go to theorize (θεωροῦμεν) at the festival of Dionysus not so that we will gain anything from the actors (indeed we pay to see them) … so too the theoria (θεωρία) of the universe must be honoured above all things that are considered to be useful. For surely we would not go to such trouble to see men imitating women and slaves, or athletes fighting and running, and not consider it right to theorize without payment (θεωρεῖν ἀμισθί) the nature and truth of reality. Indeed, Andrea Wilson Nightingale says that Aristotle considers that those who, instead of pursuing theoria for its own sake, would put it to useful ends would be engaging in theoria in the wrong way, and Richard Kraut says that, for Aristotle, theoretical activity alone has limitless value. Thomas Louis Schubeck says that, in Aristotle's view, the knowledge that guides ethical political activity does not belong to theoria. "Leading a contemplative life can be considered Aristotle's answer to the question what life humans ought to live. … The more humans engage in contemplation, the closer they are to their gods and the more perfect will be their happiness." Aristotle's view that the best life would be a purely contemplative (intellectual) one was disputed by the Stoics and others, such as the Epicureans, who saw speculation as inferior to practical ethics. Middle Platonism and Neoplatonism considered contemplation superior and saw as its goal the knowledge of God or union with him, so that a "contemplative life" was a life devoted to God rather than to any kind of activity. In the Enneads of Plotinus, a founder of Neoplatonism, everything is contemplation (theoria) and everything is derived from contemplation. The first hypostasis, the One, is contemplation (by the nous, or second hypostasis)[not in citation given] in that "it turns to itself in the simplest regard, implying no complexity or need"; this reflecting back on itself emanated (not created)[not in citation given] the second hypostasis, Intellect (in Greek Νοῦς, Nous), Plotinus describes as "living contemplation", being "self-reflective and contemplative activity par excellence", and the third hypostatic level has theoria. Knowledge of The One is achieved through experience of its power, an experience that is contemplation (theoria) of the source of all things. Plotinus agreed with Aristotle's systematic distinction between contemplation (theoria) and practice (praxis): dedication to the superior life of theoria requires abstension from practical, active life. Plotinus explained: "The point of action is contemplation. … Contemplation is therefore the end of action" and "Such is the life of the divinity and of divine and blessed men: detachments from all things here below, scorn of all earthly pleasures, the flight of the lone to the Alone." Contemplative or mystical practice is a longstanding and integral part of the life of Christian churches. In the Eastern Orthodox Churches, the predominant form is hesychasm ("stillness"). In both eastern and western Christianity it is part of mystical practices. Some Neoplatonic ideas were adopted by Christianity, among them the idea of theoria or contemplation, taken over by Gregory of Nyssa for example. [note 1] The Brill Dictionary of Gregory of Nyssa remarks that contemplation in Gregory is described as a "loving contemplation", and, according to Thomas Keating, the Greek Fathers of the Church, in taking over from the Neoplatonists the word theoria, attached to it the idea expressed by the Hebrew word da'ath, which, though usually translated as "knowledge", is a much stronger term, since it indicates the experiential knowledge that comes with love and that involves the whole person, not merely the mind. Among the Greek Fathers, Christian theoria was not contemplation of Platonic Ideas nor of the astronomical heavens of Pontic Heraclitus, but "studying the Scriptures", with an emphasis on the spiritual sense. Later, contemplation came to be distinguished from intellectual life, leading to the identification of θεωρία or contemplatio with a form of prayer distinguished from discursive meditation in both East and West. Some make a further distinction, within contemplation, between contemplation acquired by human effort and infused contemplation. In early Christianity the term "mystikos" referred to three dimensions, which soon became intertwined, namely the biblical, the liturgical and the spiritual or contemplative. The biblical dimension refers to "hidden" or allegorical interpretations of Scriptures. The liturgical dimension refers to the liturgical mystery of the Eucharist, the presence of Christ at the Eucharist. The third dimension is the contemplative or experiential knowledge of God. Under the influence of Pseudo-Dionysius the Areopagite the mystical theology came to denote the investigation of the allegorical truth of the Bible, and "the spiritual awareness of the ineffable Absolute beyond the theology of divine names." Pseudo-Dionysius' Apophatic theology, or "negative theology", exerted a great influence on medieval monastic religiosity. It was influenced by Neo-Platonism, and very influential in Eastern Orthodox Christian theology. In western Christianity it was a counter-current to the prevailing Cataphatic theology or "positive theology". According to John Romanides, in the teachings of Eastern Orthodox Christianity the quintessential purpose and goal of the Christian life is to attain theosis or 'deification', understood as 'likeness to' or 'union with' God. [note 3] Theosis is expressed as "Being, union with God" and having a relationship or synergy between God and man. [note 4] God is the Kingdom of Heaven. Theosis or unity with God is obtained by engaging in contemplative prayer, the first stage of theoria,[note 5] which results from the cultivation of watchfulness (Gk: nepsis). In theoria, one comes to see or "behold" God or "uncreated light," a grace which is "uncreated. "[note 6][note 7] In the Eastern Christian traditions, theoria is the most critical component needed for a person to be considered a theologian; however it is not necessary for one's salvation. An experience of God is necessary to the spiritual and mental health of every created thing, including human beings. Knowledge of God is not intellectual, but existential. According to eastern theologian Andrew Louth, the purpose of theology as a science is to prepare for contemplation, rather than theology being the purpose of contemplation. In the Latin or Western Church terms derived from the Latin word contemplatio such as, in English, "contemplation" are generally used in languages largely derived from Latin, rather than the Greek term theoria. The equivalence of the Latin and Greek terms was noted by John Cassian, whose writings influenced the whole of Western monasticism, in his Conferences. However, Catholic writers do sometimes use the Greek term. In discursive meditation, mind and imagination and other faculties are actively employed in an effort to understand our relationship with God. In contemplative prayer, this activity is curtailed, so that contemplation has been described as "a gaze of faith", "a silent love". [note 13] There is no clear-cut boundary between Christian meditation and Christian contemplation, and they sometimes overlap. Meditation serves as a foundation on which the contemplative life stands, the practice by which someone begins the state of contemplation. The difference between these two conditions of the soul is like the difference between working, and enjoyment of the fruit of our work; between receiving a gift, and profiting by it; between the toil of travelling and the rest of our journey's end". Meditation is an activity of one's spirit by reading or otherwise, while contemplation is a spontaneous activity of that spirit. In meditation, man's imaginative and thinking power exert some effort. Contemplation then follows to relieve man of all effort. Contemplation is the soul's inward vision and the heart's simple repose in God. An exercise long used among Christians for acquiring contemplation, one that is "available to everyone, whether he be of the clergy or of any secular occupation", is that of focusing the mind by constant repetition a phrase or word. Saint John Cassian recommended use of the phrase "O God, make speed to save me: O Lord, make haste to help me". Another formula for repetition is the name of Jesus. or the Jesus Prayer, which has been called "the mantra of the Orthodox Church", although the term "Jesus Prayer" is not found in the Fathers of the Church. The author of The Cloud of Unknowing recommended use of a monosyllabic word, such as "God" or "Love". The Jesus Prayer, which, for the early Fathers, was just a training for repose, the later Byzantines developed into hesychasm, a spiritual work of its own, attaching to it technical requirements and various stipulations that became a matter of serious theological controversy, and are still of great interest to Byzantine, Russian and other eastern churches. While he maintains his practice of the Jesus Prayer, the Hesychast cultivates nepsis, watchful attention. Sobriety contributes to this mental askesis that rejects tempting thoughts; it puts a great emphasis on focus and attention. The Hesychast is to pay extreme attention to the consciousness of his inner world and to the words of the Jesus Prayer, not letting his mind wander in any way at all. The Jesus Prayer invokes an attitude of humility essential for the attainment of theoria. [note 14] The Jesus Prayer is also invoked to pacify the passions, as well as the illusions that lead a person to actively express these passions. The worldly, neurotic mind is habitually accustomed to seek perpetuation of pleasant sensations and to avoid unpleasant ones. This state of incessant agitation of the mind is attributed to the corruption of primordial knowledge and union with God (the Fall of Man and the defilement and corruption of consciousness, or nous). [note 15] According to St. Theophan the Recluse, though the Jesus Prayer has long been associated with the Prayer of the Heart, they are not synonymous. Methods of prayer in the Roman Catholic Church include recitation of the Jesus Prayer, which "combines the Christological hymn of Philippians 2:6-11 with the cry of the publican (Luke 18:13) and the blind man begging for light (Mark 10:46-52). By it the heart is opened to human wretchedness and the Saviour's mercy"; invocation of the holy name of Jesus; recitation, as recommended by Saint John Cassian, of "O God, come to my assistance; O Lord, make haste to help me" or other verses of Scripture; repetition of a single monosyllabic word, as suggested by the Cloud of Unknowing, such as "God" or "Love"; the method used in Centering Prayer; the use of Lectio Divina. In modern times, Centering prayer, which is also called "Prayer of the heart" and "Prayer of Simplicity,"[note 16] has been popularized by Thomas Keating, drawing on Hesychasm and the Cloud of Unknowing. [note 17] The practice of contemplative prayer has also been encouraged by the formation of associations like The Julian Meetings and the Fellowship of Meditation. Theoria or illumination, also called "natural" or "acquired contemplation;"
Purification and illumination of the noetic faculty are preparations for the vision of God. Without this preparations it is impossible for man's selfish love to be transformed into selfless love. This transformation takes place during the higher level of the stage of illumination called theoria, literally meaning vision, in this case vision by means of unceasing and uninterrupted memory of God. Those who remain selfish and self-centered with a hardened heart, closed to God's love, will not see the glory of God in this life. However, they will see God's glory eventually, but as an eternal and consuming fire and outer darkness. the seventh is the indwelling or unitive stage that is truly mystical contemplation. transforming or deifying union, or spiritual marriage (properly) of the soul with God. The first three are weak, medium, and the energetic states of the same grace. The transforming union differs from them specifically and not merely in intensity. It consists in the habitual consciousness of a mysterious grace which all shall possess in heaven: the anticipation of the Divine nature. The soul is conscious of the Divine assistance in its superior supernatural operations, those of the intellect and the will. Spiritual marriage differs from spiritual espousals inasmuch as the first of these states is permanent and the second only transitory. Purification precedes conversion and constitutes a turning away from all that is unclean and unwholesome. This is a purification of mind and body. As preparation for theoria, however, the concept of purification in this three-part scheme refers most importantly to the purification of consciousness (nous), the faculty of discernment and knowledge (wisdom), whose awakening is essential to coming out of the state of delusion that is characteristic of the worldly-minded. After the nous has been cleansed, the faculty of wisdom may then begin to operate more consistently. With a purified nous, clear vision and understanding become possible, making one fit for contemplative prayer. In the Eastern Orthodox ascetic tradition called hesychasm, humility, as a saintly attribute, is called Holy Wisdom or sophia. Humility is the most critical component to humanity's salvation. [note 19] Following Christ's instruction to "go into your room or closet and shut the door and pray to your father who is in secret" (Matthew 6:6), the hesychast withdraws into solitude in order that he or she may enter into a deeper state of contemplative stillness. By means of this stillness, the mind is calmed, and the ability to see reality is enhanced. The practitioner seeks to attain what the apostle Paul called 'unceasing prayer'. The Great Schema worn by Orthodox monks and nuns of the most advanced degree. In the Orthodox Churches, noetic prayer is the first stage of theoria. [note 5] Theoria proper is the vision of God, which is beyond conceptual knowledge, like the difference between reading about the experience of another, and reading about one's own experience. In the Roman Catholic Church, in natural or acquired contemplation there is one dominant thought or sentiment which recurs constantly and easily (although with little or no development) amid many other thoughts, beneficial or otherwise. The prayer of simplicity[note 16] often has a tendency to simplify itself even in respect to its object, leading one to think chiefly of God and of his presence, but in a confused manner. Definitions similar to that of Saint Alphonsus Maria de Liguori are given by Adolphe Tanquerey ("a simple gaze on God and divine things proceeding from love and tending thereto") and Saint Francis de Sales ("a loving, simple and permanent attentiveness of the mind to divine things"). What is contemplative prayer? St. Teresa answers: 'Contemplative prayer [oración mental] in my opinion is nothing else than a close sharing between friends; it means taking time frequently to be alone with him who we know loves us.' Contemplative prayer seeks him 'whom my soul loves'. It is Jesus, and in him, the Father. We seek him, because to desire him is always the beginning of love, and we seek him in that pure faith which causes us to be born of him and to live in him. In this inner prayer we can still meditate, but our attention is fixed on the Lord himself. In the Orthodox Churches, the highest theoria, the highest consciousness that can be experienced by the whole person, is the vision of God. [note 22] God is beyond being; He is a hyper-being; God is beyond nothingness. Nothingness is a gulf between God and man. God is the origin of everything, including nothingness. This experience of God in hypostasis shows God's essence as incomprehensible, or uncreated. God is the origin, but has no origin; hence, he is apophatic and transcendent in essence or being, and cataphatic in foundational realities, immanence and energies. This ontic or ontological theoria is the observation of God. A nous in a state of ecstasy or ekstasis, called the eighth day, is not internal or external to the world, outside of time and space; it experiences the infinite and limitless God. [note 18][note 23] Nous is the "eye of the soul" (Matthew 6:22–34). [note 24] Insight into being and becoming (called noesis) through the intuitive truth called faith, in God (action through faith and love for God), leads to truth through our contemplative faculties. This theory, or speculation, as action in faith and love for God, is then expressed famously as "Beauty shall Save the World". This expression comes from a mystical or gnosiological perspective, rather than a scientific, philosophical or cultural one. In the Roman Catholic Church, infused or higher contemplation, also called intuitive, passive or extraordinary, is a supernatural gift by which a person's mind will become totally centered on God. It is a form of mystical union with God, a union characterized by the fact that it is God, and God only, who manifests himself. Under this influence of God, which assumes the free cooperation of the human will, the intellect receives special insights into things of the spirit, and the affections are extraordinarily animated with divine love. This union that it entails may be linked with manifestations of a created object, as, for example, visions of the humanity of Christ or an angel or revelations of a future event, etc. They include miraculous bodily phenomena sometimes observed in ecstatics. It is a wordless awareness and love that we of ourselves cannot initiate or prolong. The beginnings of this contemplation are brief and frequently interrupted by distractions. The reality is so unimposing that one who lacks instruction can fail to appreciate what exactly is taking place. Initial infused prayer is so ordinary and unspectacular in the early stages that many fail to recognize it for what it is. Yet with generous people, that is, with those who try to live the whole Gospel wholeheartedly and who engage in an earnest prayer life, it is common. Dubay considers infused contemplation as common only among "those who try to live the whole Gospel wholeheartedly and who engage in an earnest prayer life". Other writers view contemplative prayer in its infused supernatural form as far from common. John Baptist Scaramelli, reacting in the 17th century against quietism, taught that asceticism and mysticism are two distinct paths to perfection, the former being the normal, ordinary end of the Christian life, and the latter something extraordinary and very rare. Jordan Aumann considered that this idea of the two paths was "an innovation in spiritual theology and a departure from the traditional Catholic teaching". And Jacques Maritain proposed that one should not say that every mystic necessarily enjoys habitual infused contemplation in the mystical state, since the gifts of the Holy Spirit are not limited to intellectual operations. In the Orthodox Churches, theoria is regarded to lead to true spiritual knowledge, in contrast to the false or incomplete knowledge of rational thought, c.q. conjecture, speculation,[note 23] dianoia, stochastic and dialectics). After illumination or theoria, humanity is in union with God and can properly discern, or have holy wisdom. Hence theoria, the experience or vision of God, silences all humanity. The most common false spiritual knowledge is derived not from an experience of God, but from reading another person's experience of God and subsequently arriving at one's own conclusions, believing those conclusions to be indistinguishable from the actual experienced knowledge. False spiritual knowledge can also be iniquitous, generated from an evil rather than a holy source. The gift of the knowledge of good and evil is then required, which is given by God. Humanity, in its finite existence as created beings or creatures, can never, by its own accord, arrive at a sufficiently objective consciousness. Theosis is the gradual submission of a person to the good, who then with divine grace from the person's relationship or union with God, attains deification. Illumination restores humanity to that state of faith existent in God, called noesis, before humanity's consciousness and reality was changed by their fall. In the orthodox Churches, false spiritual knowledge is regarded as leading to spiritual delusion (Russian prelest, Greek plani), which is the opposite of sobriety. Sobriety (called nepsis) means full consciousness and self-realization (enstasis), giving true spiritual knowledge (called true gnosis). Prelest or plani is the estrangement of the person to existence or objective reality, an alienation called amartía. This includes damaging or vilifying the nous, or simply having a non-functioning noetic and neptic faculty. Evil is, by definition, the act of turning humanity against its creator and existence. Misotheism, a hatred of God, is a catalyst that separates humanity from nature, or vilifies the realities of ontology, the spiritual world and the natural or material world. Reconciliation between God (the uncreated) and man is reached through submission in faith to God the eternal, i.e. transcendence rather than transgression[note 25] (magic). The Trinity as Nous, Word and Spirit (hypostasis) is, ontologically, the basis of humanity's being or existence. The Trinity is the creator of humanity's being via each component of humanity's existence: origin as nous (ex nihilo), inner experience or spiritual experience, and physical experience, which is exemplified by Christ (logos or the uncreated prototype of the highest ideal) and his saints. The following of false knowledge is marked by the symptom of somnolence or "awake sleep" and, later, psychosis. Theoria is opposed to allegorical or symbolic interpretations of church traditions. In the Orthodox practice, once the stage of true discernment (diakrisis) is reached (called phronema), one is able to distinguish false gnosis from valid gnosis and has holy wisdom. The highest holy wisdom, Sophia, or Hagia Sophia, is cultivated by humility or meekness, akin to that personified by the Theotokos and all of the saints that came after her and Christ, collectively referred to as the ecclesia or church. This community of unbroken witnesses is the Orthodox Church. Wisdom is cultivated by humility (emptying of oneself) and remembrance of death against thymos (ego, greed and selfishness) and the passions. Practicing asceticism is being dead to the passions and the ego, collectively known as the world. Fifteen Carmelite nuns allowed scientists to scan their brains with fMRI while they were meditating, in a state known as Unio Mystica or Theoria. The results showed the regions of the brain that were activated when they considered themselves to be in mystical union with God. In modern times theoria is sometimes treated as distinct from the meaning given to it in Christianity, linking the word not with contemplation but with speculation. Boethius (c. 480–524 or 525) translated the Greek word theoria into Latin, not as contemplatio but as speculatio, and theoria is taken to mean speculative philosophy. A distinction is made, more radical than in ancient philosophy, between theoria and praxis, theory and practice. ^ "The analogy between (Gregory's) terminology and thought and that of the ancient initiators of the philosophic ideal of life is a perfect one. The ascetics themselves are called by him 'philosophers' or 'the philosophic chorus'. Their activity is called 'contemplation' (θεωρία), and to the present day this word, even when we use it to designate the θεωρητικός βίος of the ancient Greek philosophers, has preserved the overtone which transformation into a technical term of Christian asceticism has added to it"
^ In their biblical exegesis, whether of Alexandrian or Antiochene tradition, the Fathers, "with little or no understanding of the progressive nature of revelation, where the literal sense would not suffice, [...] resorted to allegory or to theoria (Chrysostom and the Antiochenes)." According to John Ramonides, theosis is "the selfless love of glorification (theosis) dedicated to the common good." ^ Metropolitan Hierotheos Vlachos: "Theosis-Divinisation is the participation in the Uncreated grace of God. 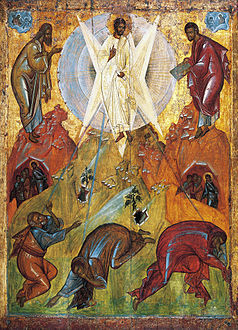 Theosis is identified and connected with the theoria (vision) of the Uncreated Light (see note above). It is called theosis in grace because it is attained through the energy, of the divine grace. It is a co-operation of God with man, since God is He Who operates and man is he who co-operates." ^ a b Metropolitan Hierotheos Vlachos: "Noetic prayer is the first stage of theoria." ^ Theophan the Recluse: "The contemplative mind sees God, in so far as this is possible for man." ^ Metropolitan Hierotheos Vlachos: "This is what Saint Symeon the New Theologian teaches. In his poems, proclaims over and over that, while beholding the uncreated Light, the deified man acquires the Revelation of God the Trinity. Being in "theoria" (vision of God), the saints do not confuse the hypostatic attributes. The fact that the Latin tradition came to the point of confusing these hypostatic attributes and teaching that the Holy Spirit proceeds from the Son also, shows the non-existence of empirical theology for them. Latin tradition speaks also of created grace, a fact which suggests that there is no experience of the grace of God. For, when man obtains the experience of God, then he comes to understand well that this grace is uncreated. Without this experience there can be no genuine "therapeutic tradition."" 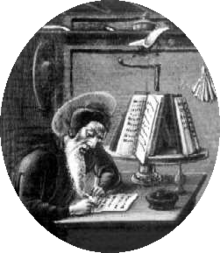 ^ Catholic Encyclopedia: "But it was Simeon, "the new theologian" (c. 1025-c. 1092; see Krumbacher, op. cit., 152-154), a monk of Studion, the "greatest mystic of the Greek Church" (loc. cit. ), who evolved the quietist theory so elaborately that he may be called the father of Hesychasm. For the union with God in contemplation (which is the highest object of our life) he required a regular system of spiritual education beginning with baptism and passing through regulated exercises of penance and asceticism under the guidance of a director. But he had not conceived the grossly magic practices of the later Hesychasts; his ideal is still enormously more philosophical than theirs." ^ A basic characteristic of the Frankish scholastic method, mislead by Augustinian Platonism and Thomistic Aristotelianism, had been its naive confidence in the objective existence of things rationally speculated about. By following Augustine, the Franks substituted the patristic concern for spiritual observation, (which they had found firmly established in Gaul when they first conquered the area) with a fascination for metaphysics. They did not suspect that such speculations had foundations neither in created nor in spiritual reality. No one would today accept as true what is not empirically observable, or at least verifiable by inference, from an attested effect. so it is with patristic theology. Dialectical speculation about God and the Incarnation as such are rejected. Only those things which can be tested by the experience of the grace of God in the heart are to be accepted. "Be not carried about by divers and strange teachings. For it is good that the heart by confirmed by grace," a passage from Hebrews 13.9, quoted by the Fathers to this effect. ^ www.monachos.net: "At the heart of Barlaam's teaching is the idea that God cannot truly be perceived by man; that God the Transcendent can never be wholly known by man, who is created and finite." ^ Romanides: "And, indeed, the Franks believed that the prophets and apostles did not see God himself, except possibly with the exception of Moses and Paul. What the prophets and apostles allegedly did see and hear were phantasmic symbols of God, whose purpose was to pass on concepts about God to human reason. Whereas these symbols passed into and out of existence, the human nature of Christ is a permanent reality and the best conveyor of concepts about God. Hermit: What makes you go away? Is it fasting? The demons: We do not eat or drink. The demons: We do not sleep. Hermit: Is it separation from the world? The demons: We live in the deserts. Hermit: What power sends you away then? The demons: Nothing can overcome us, but only humility. Do you see how humility is victorious over the demons? ^ THE ILLNESS AND CURE OF THE SOUL by Metropolitan Hierotheos of Nafpaktos: "If one wishes to be an Orthodox theologian one must begin from the state of Adam as it was before the Fall, what happened with the Fall and how we can be restored to our former state, even reach there where Adam did not. If a theology does not speak of man's fall; if it does not designate precisely what it is, and if it does not speak of man's resurrection, then what kind of theology is it? Surely, it is not Orthodox. In any case, we were saying earlier that Orthodoxy is a therapeutic treatment and science, and also that Theology is a therapeutic treatment. It cures man. Yet, if we do not examine where man's illness lies, how can we know what we should heal? If, regarding his body, man follows a wrong treatment he will never be cured. The same also happens with the soul. It must become clear to us that the darkness of nous is its illness and illumination is its cure. Mysteries and all the ascetic tradition of the Church are meant to lead us where Adam was before the Fall, that is, to the illumination of the nous, and from there to theosis, which is man's original destination. Therefore, it is very important for us to know exactly what the illness is. If we ignore our inner sickness our spiritual life ends up in an empty moralism, in a superficiality. Many people are against the social system. They blame society, family, the existing evil, etc. for their own problem. However the basic problem, man's real malady is the darkness of his nous. When one's nous is illumined one thus becomes free from slavery to everything in the environment, e.g. anxiety, insecurity, etc." ^ a b catholicculture.org: "Meditation replaced by a purer, more intimate prayer consisting in a simple regard or loving thought on God, or on one of his attributes, or on some mystery of the Christian faith. Reasoning is put aside and the soul peacefully attends to the operations of the Spirit with sentiments of love." ^ "Over the centuries, this prayer has been called by various names such as the Prayer of Faith, Prayer of the Heart, Prayer of Simplicity, Prayer of Simple Regard, Active Recollection, Active Quiet and Acquired Contemplation"
^ a b Ecstasy comes when, in prayer, the nous abandons every connection with created things: first "with everything evil and bad, then with neutral things" (2,3,35;CWS p.65). Ecstasy is mainly withdrawal from the opinion of the world and the flesh. With sincere prayer the nous "abandons all created things" (2,3,35;CWS p.65). This ecstasy is higher than abstract theology, that is, than rational theology, and it belongs only to those who have attained dispassion. It is not yet union; the ecstasy which is unceasing prayer of the nous, in which one's nous has continuous remembrance of God and has no relation with the `world of sin', is not yet union with God. This union comes about when the Paraclete "...illuminates from on high the man who attains in prayer the stage which is superior to the highest natural possibilities and who is awaiting the promise of the Father, and by His revelation ravishes him to the contemplation of the light" (2,3,35;CWS p.65). Illumination by God is what shows His union with man. (GK: apathea) and clarity of vision. Vision here refers to the vision of the nous that has been purified by ascetic practice. ^ There was an anchorite (hermit) who was able to banish demons; and he asked them: Hermit: What make you go away? Is it fasting? The demons: We do not eat or drink. Hermit: Is it vigils? The demons: We do not sleep. Hermit: Is it separation from the world? The demons: We live in the deserts. Hermit: What power sends you away then? The demons: Nothing can overcome us, but only humility. Do you see how humility is victorious over the demons? ^ A basic characteristic of the Frankish scholastic method, mislead by Augustinian Platonism and Thomistic Aristotelianism, had been its naive confidence in the objective existence of things rationally speculated about. By following Augustine, the Franks substituted the patristic concern for spiritual observation, (which they had found firmly established in Gaul when they first conquered the area) with a fascination for metaphysics. They did not suspect that such speculations had foundations neither in created nor in spiritual reality. No one would today accept as true what is not empirically observable, or at least verifiable by inference, from an attested effect. So it is with patristic theology. Dialectical speculation about God and the Incarnation as such are rejected. Only those things which can be tested by the experience of the grace of God in the heart are to be accepted. "Be not carried about by divers and strange teachings. For it is good that the heart be confirmed by grace," a passage from Hebrews 13.9, quoted by the Fathers to this effect. ^ In the present case, Roman Catholic theologians are either confusing two dogmas — that is, the dogma of the personal existence of the Hypostases and the dogma of the Oneness of Essence, and it is absolutely essential to distinguish this from another dogma — or else they are confusing the inner relations of the All Holy Trinity with the providential actions and manifestations of the Father, the Son, and the Holy Spirit, which are directed towards the world and the human race. That the Holy Spirit is One in Essence with the Father and the Son, that therefore He is the Spirit of the Father and of the Son, is an indisputable Christian truth, for God is a Trinity One in Essence and Indivisible. [...] The expression, 'the Spirit of the Father and the Son", is likewise in itself quite Orthodox. But these expressions refer to the dogma of the Oneness of Essence, and it is absolutely essential to distinguish this from another dogma, the dogma of the begetting and the procession, in which, as the Holy Fathers express it, is shown the Cause of the existence of the Son and the Spirit. All of the Eastern Fathers acknowledge that the Father is monos aitios, the sole Cause” of the Son and the Spirit. ^ a b Vladimir Lossky: "It is necessary to renounce both sense and all the workings of reason, everything which may be known by the senses or the understanding, both that which is and all that is not, in order to be able to attain in perfect ignorance to union with Him who transcends all being and all knowledge. It is already evident that this is not simply a question of a process of dialectic but of something else: a purification, a katharis, is necessary. One must abandon all that is impure and even all that is pure. One must then scale the most sublime heights of sanctity leaving behind one all the divine luminaries, all the heavenly sounds and words. It is only thus that one may penetrate to the darkness wherein He who is beyond all created things makes His dwelling." ^ "The eye is the lamp of the body. If your eye is healthy, your whole body will be full of light. But if your eye is unhealthy, your whole body will be full of darkness. If then the light within you is darkness, how great is that darkness!" NRSV But what is the noetic function? In the Holy Scriptures there is, already, the distinction between the spirit of man (his nous) and the intellect (the logos or mind). The spirit of man in patristics is called nous to distinguish it from the Holy Spirit. The spirit, the nous, is the eye of the soul (see Matt. 6:226). ^ History of Russian Philosophy «История российской Философии »(1951) by N. O. Lossky section on N. O. Lossky's philosophy pg262 "There is another kind of selfishness which violates the hierarchy of values much more: some agents who strive for perfection and the absolute fullness of being and even for the good of the whole world are determined to do it in their own way, so that they should occupy the first place and stand higher than all other beings and even the Lord God himself. Pride is the ruling passion of such beings. They enter into rivalry with God, thinking that they are capable of ordering the world better than its Creator. Pursuing an impossible aim, they suffer defeat at every step and begin to hate God. This is what Satan does. Selfishness separates us from God in so far as we put before us purposes incompatible with God's will that the world should be perfect. In the same way selfishness separates an agent in a greater or lesser degree from other agents: his aims and actions cannot be harmonized with the actions of other beings and often lead to hostility and mutual opposition. ^ "We have a culture that creates saints, holy people. Our people's ideal is not to create wisemen. Nor was this the ideal of ancient Hellenic culture and civilization. Hellenic anthropocentric (human-centered) Humanism is transformed into Theanthropism (God-humanism) and its ideal is now the creation of Saints, Holy people who have reached the state of theosis (deification)." ^ Catechism of the Catholic Church, 2721). ^ Gerhard Schuhmacher, Why is contemplation so highly regarded by Aristotle? ^ "Everything is contemplation" (Cambridge Companion to Plotinus, p. 32). ^ "Everything comes from contemplation" (Cambridge Companion to Plotinus, p. 32). ^ "Plotinus suggests that the One subsists by thinking itself as itself" (Internet Encyclopedia of Philosophy: A Peer-Reviewed Academic Resource: Neoplatonism). ^ "From the point of view of the historian, the presence of Neoplatonic ideas in Christian thought is undeniable" (Dominic J. O'Meara (editor), Neoplatonism and Christian Thought (State University of New York Press 1982 ISBN 0-87395-492-0), p. x). ^ (Werner Jaeger, Two Rediscovered Works of Ancient Christian Literature: Gregory of Nyssa and Macarius (Brill, Leiden 1954), pp. 21-22). ^ a b c d e King 2002, p. 15. ^ a b "Gellman, Jerome, "Mysticism", The Stanford Encyclopedia of Philosophy (Summer 2011 Edition), Edward N. Zalta (ed.)". Plato.stanford.edu. Retrieved 2013-11-06. ^ Dupré 2005, p. 6341. ^ King 2002, p. 195. ^ John Breck, Scripture in Tradition: The Bible and Its Interpretation in the Orthodox Church, St Vladimir's Seminary Press 2001, p. 11. ^ Breck, Scripture in Tradition, p. 37). ^ John J. O'Keefe, Russell R. Reno, Sanctified Vision (JHU Press 2005 ISBN 978-0-8018-8088-9), p. 15). ^ Theophan the Recluse, What Is prayer?. Cited in The Art of Prayer: An Orthodox Anthology,p.73, compiled by Igumen Chariton of Valamo, trans, E. Kadloubovsky and E.M. Palmer, ed. Timothy Ware, 1966, Faber & Faber, London. ^ a b deCatanzaro 1980, pp. 9–10. ^ "FRANKS, ROMANS, FEUDALISM, AND DOCTRINE Part 2". Retrieved September 12, 2010. ^ "St. Nicholas Orthodox Church » Mysticism, Women and the Christian Orient". Stnicholaspdx.org. Retrieved September 4, 2013. ^ "Meditation is a prayerful quest engaging thought, imagination, emotion, and desire. Its goal is to make our own in faith the subject considered, by confronting it with the reality of our own life"(Catechism of the Catholic Church, 2723). ^ V Lossky Vision of God pg 123 "Knowledge is limited to what exists: now, as the cause of all being(The Divine Names, I, 1, col.588) or rather He is superior to all oppositions between being and non-being. ^ a b "Louis J. Puhl, S.J. Translation - The Spiritual Exercises". Ignatian Spirituality. Retrieved 7 March 2017. ^ "Orthodox Psychotherapy Chapter Six". Archived from the original on January 5, 2009. Retrieved September 12, 2010. ^ a b M. Beauregard & V. Paquette (2006). "Neural correlates of a mystical experience in Carmelite nuns". Neuroscience Letters. Elsevier. 405 (3): 186–90. doi:10.1016/j.neulet.2006.06.060. ISSN 0304-3940. PMID 16872743. Vladimir Lossky, The Vision of God (SVS Press 1997. ISBN 0-913836-19-2. Louth, Andrew. The Origins of the Christian Mystical Tradition: From Plato to Denys. Oxford, 1983 (repr. 2003). ISBN 0191608777. Aumann, Jordan. Christian Spirituality in the Catholic Tradition. Sheed & Ward, 1985; p. 247. ISBN 0-89870-068-X. Dubay, Thomas. Fire Within: Teresa of Avila, John of the Cross and the Gospel on Prayer. Ignatius Press, 1989. ISBN 0-89870-263-1. Keating, Thomas. Active Meditations for Contemplative Prayer. Continuum International Publishing Group, 1997. ISBN 0-8264-1061-8. Keating, Thomas. Foundations for Centering Prayer and the Christian Contemplative Life. Continuum International Publishing Group, 2002. ISBN 0-8264-1397-8. Keating, Thomas. Open Mind, Open Heart: The Contemplative Dimension of the Gospel. Continuum International Publishing Group, 2002. ISBN 0-8264-1420-6. Merton, Thomas. Contemplative Prayer. Image Books, 1996. ISBN 0-385-09219-9. Underhill, Evelyn. Practical Mysticism: A Little Book for Normal People. Read Books, 2006. ISBN 1406796328. The Catechism of the Catholic Church has a subsection on contemplative prayer within its section on prayer in the Christian life. Yungen, Ray. A Time of Departing: How Ancient Mystical Practices Are Uniting Christians with the World's Religions. Lighthouse Trails Publishing, 2006, 2nd edition. ISBN 978-0-9721512-7-6. Look up θεωρία in Wiktionary, the free dictionary. Aristotle: Why the Contemplative Life is the Happiest (Nicomachean Ethics 10.7). English and Greek. Ignatius Loyola, Contemplation to Gain Love of God. From the Spiritual Exercises of Ignatius of Loyola. This page was last edited on 18 April 2019, at 11:51 (UTC).